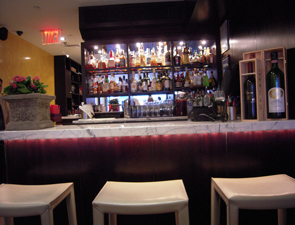 Located in the “Plaza district” of Midtown Manhattan, the world’s largest and busiest commercial district, lies a gem of a restaurant: Il Corso. Steps off of Fifth Avenue in a neighborhood that includes such notable high-end establishments as the St. Regis Hotel, the Peninsula Hotel, the Rockefeller Apartments, Tiffany’s, Bendel, Bergdorf Goodman and Takashimaya, to name a few, sits Il Corso, where you can enjoy an unpretentious yet delicious meal in Midtown. Don’t let its small size fool you: The flavors here are big and bold. The restaurant was founded in March 1993 by two women from the south of Italy, Giovanna Miranda and Angela Castaldo, who named it “Il Corso” -- which is Italian for “the path” -- in honor of their goal, which was to lead their guests down a path towards a wonderful culinary experience. The founders have succeeded with their goal, as a meal at Il Corso really is a journey down a delicious path. The path begins outside. The exterior is simply lovely and features a wall of glass doors framed in rich wood that tells you you’ve arrived. A sunset-hued awning and a vertical brown banner -- both emblazoned with the words "Il Corso" in bold yet elegant type -- sit above a dark wooden bench framed by two stone planters filled with dramatic plants. Weather permitting, the glass doors remain open during the day in the spring and summer time, although the doors near the tables remain closed at night while the main door is held open by a lovely stone urn. 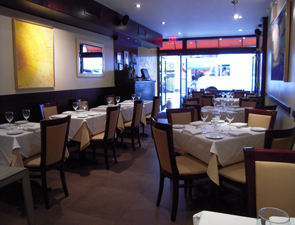 A brass plaque reading "Il Corso Ristorante Italiano" sits to the left of the glass doors above a framed menu and one of the planters. Bricks walls frame the glass doors and add to the homey cucina feeling.